Source: Media Briefing, p. 27 [PDF]. Mayor John Tory and Chief Planner Jennifer Keesmaat continue to redraw Toronto’s transit map with their January 21 announcement of a new plan for Scarborough. With a report to Executive Committee on January 28, Keesmaat will set in motion another Council debate about the merits of subways and LRTs in Scarborough, and John Tory’s SmartTrack will play a supporting role [PDF]. John Tory’s SmartTrack service running on the Stouffville GO corridor with stops every few kilometres from St. Clair north to Steeles. The Scarborough Subway Extension (SSE), a line seen by many subway champions as the jewel in Scarborough’s transit crown. The Crosstown East, an extension of the Eglinton LRT east and north to the University of Toronto Scarborough Campus (UTSC). An unspecified future rapid transit line on Sheppard that could be either the Sheppard LRT or an extended Sheppard Subway to the Scarborough Town Centre (STC). Improved bus service on east-west arterials feeding in to the SmartTrack stations. The map looks quite beautiful, and it seduces by addressing multiple controversies that have bedevilled Scarborough’s transit politics for years. Military language flowed at Tory’s press conference and the following media briefing with talk of an end to “Civil War“, and “peace in the land“. This is a very political map, with something for everyone, packaging Scarborough Council’s local boosterism with an underpinning of planning sophistry. The plan is guaranteed to get lots of votes at Council, if only to put the whole matter on ice long enough for the city to get beyond the transit battles of the last election campaign. Can it work? Will any of this actually be built? Scarborough has a limited amount of rapid transit today with the Bloor-Danforth subway in its southwest corner at Kennedy Station, and the RT running north and east through STC to McCowan Station. GO provides service along two corridors, but trains are infrequent (the north-south Stouffville line runs only peak period, peak direction) and their purpose is to serve commuters into downtown. GO is not integrated with local transit service in Scarborough as anyone who might try using it for work travel knows all too well. Although there are many bus routes, the frequent ones are mainly on an east-west axis. Additionally, “frequent” can be true more in theory than practice when advertised “10 minute or better” service is beset by gaps and bunching. Access to employment areas is poor, although this is something of a chicken-and-egg situation—areas designed primarily for auto access make for poor transit demand especially on a network organized to get commuters downtown, not to move them within Scarborough. Source: Media Briefing, p. 3 [PDF]. This conflicts strongly with actual travel patterns. Of the 1.15 million trips originating in Scarborough on a typical weekday, 60 per cent stay within Scarborough itself and only 6 per cent are headed downtown. The remainder go elsewhere in Toronto or the GTA in roughly equal proportions. Source: Executive Committee Report, p. 15 [PDF]. The situation is different for transit trips which number 206,000. To begin with, transit only captures 17.9 per cent of the travel market, but it carries a larger portion of the downtown travel, almost four times the share for trips of all kinds. Within Scarborough, transit gets a lower share of the travel, and this falls even further outside of the 416. Source: Executive Committee Report, p. 16 [PDF]. This table recasts the charts and percentages into numbers for easy comparison. Source: Adapted from Executive Committee Report, pp. 15-16 [PDF]. Missing from these data is a breakdown of peak and off-peak travel. The transit network looks much different outside of rush hour, and the share of travel then is probably much lower. Source: Media Briefing, p. 9 [PDF]. 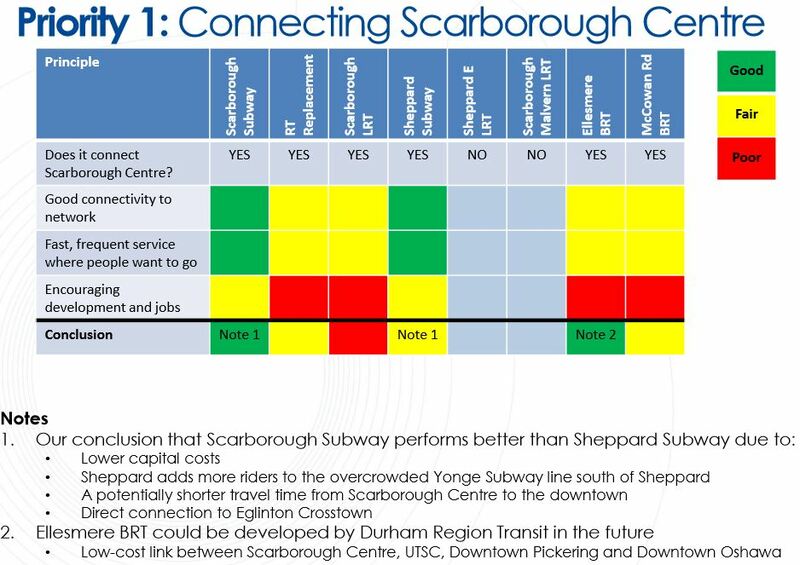 These numbers show the importance of trips within Scarborough, but one should be careful not to overstate this. Any commuting trip that is within Scarborough will generate a “Scarborough trip” both ways because both origins lie inside that territory. Trips to downtown, by contrast, show up as only one Scarborough trip, but these still require transit service for their return journey. Even with this adjustment, there is a lot of travel within Scarborough, and transit only gets about one seventh of the total. This is actually less than the share transit achieves for trips to the “Rest of Toronto” although that is probably dominated by travel to areas close to subway lines. If transit is to make a real difference in Scarborough, it must address a much wider set of travel demands. Source: Executive Committee Report, p. 23 [PDF]. Scarborough Town Centre is a big place comparable to a large chunk of downtown Toronto. Source: Media Briefing, p. 14 [PDF]. Here is the same area shown in the Official Plan. Source: Executive Committee Report, p. 10 [PDF]. The problem with this map should be obvious—not only does downtown have a finely-grained street grid rather than acres of parking, it has a much higher population and employment density than will ever be seen in Scarborough, and a transit network to match. A single subway line approaching STC from the south with one station will not link much of Toronto to any employment that might develop. Indeed, it is a north-south link to an area that is an east-west rectangle. That’s where the Scarborough RT or its now-dead replacement, the Scarborough LRT, would come in with multiple stops serving neighbourhoods across the precinct. Ironically, the Official Plan map shows an east-west RT line including potential stops at Brimley and at Bellamy, precisely the sort of distribution needed to make the entire Town Centre transit accessible. A further challenge both for the TTC and for transit riders in northern Scarborough is the organization of bus service around two separate rapid transit lines. Should routes feed into the subway at STC as they do with the RT today, or should the focus be westward to the SmartTrack stations? If riders really want that fast route downtown, the Town Centre could be left high and dry with less bus service than it has today. Source: Media Briefing, p. 20 [PDF]. The eastern extension of the Crosstown LRT from Kennedy Station to UTSC campus is a modified version of the “Scarborough-Malvern LRT” proposed in Transit City. The name, which persists in many references, is misleading because the original plan, ending at Malvern Centre, was modified years ago by replacing the Malvern service with the extended Scarborough LRT linking to STC. 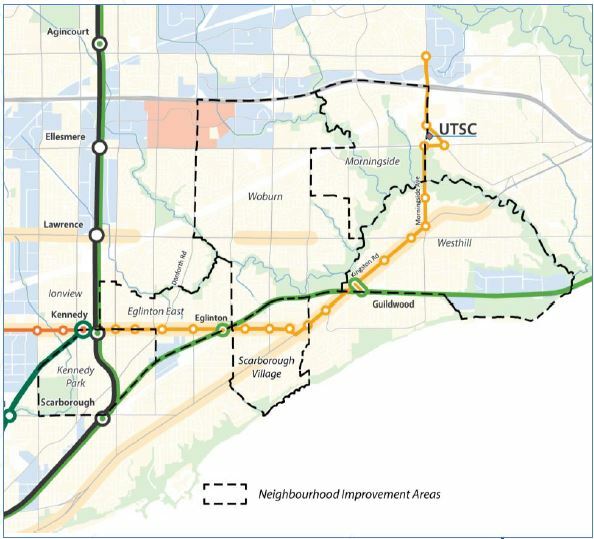 The map above shows Crosstown East running north to Sheppard, but this scheme has been “optimized” to end at UTSC with a possible future extension. That really depends on the future of a Sheppard LRT coming east to meet the Crosstown at the Scarborough campus which will become a major transit hub in eastern Toronto. The Crosstown East would serve areas that have not, until now, been part of the Scarborough Subway discussions on Eglinton Avenue, Kingston Road and Morningside Avenue. The reappearance of this line in transit plans is a welcome change in a debate incessantly focused on the Town Centre. The combination of additional capacity over bus service and closer stop spacing compared to a subway means that better transit will reach a large part of the Crosstown corridor, not just a single node as with the subway to STC. SmartTrack is the wild card in this entire plan because nobody really knows what service it will provide or how it will integrate with the GO and TTC networks. The scheme proposed by mayoral candidate John Tory foresaw trains every 15 minutes intermixed with regular GO commuter service, although he claimed very high projected ridership could not have been handled by only four trains per hour. 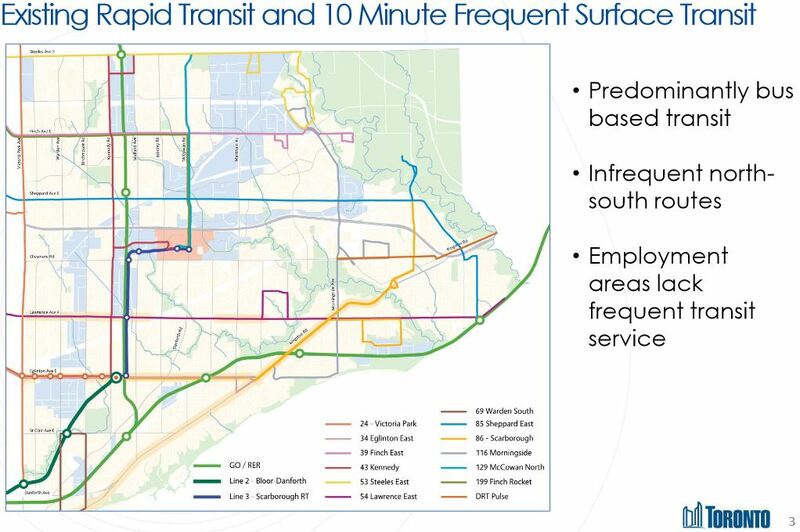 With the Eglinton West study released a week ago, we now know that much more frequent SmartTrack service, as often as every five minutes, will be needed to attract those riders. But there is one important catch: nobody knows if that level of SmartTrack service can fit on the GO corridors or what its effect will be on Union Station’s capacity. What would be the effect on neighbourhoods of adding two tracks to already-wide railways? How much capacity planned for GO expansion will be consumed by SmartTrack riders? Equally important is the question of fares. John Tory promotes SmartTrack as a service with TTC fares, but exactly what this means was not immediately clear from the announcement and media briefing. Metrolinx is studying regional fare integration, and the meaning of a “TTC fare” could be quite different in the future than it is today with options such as distance-based fares and a premium for travel on the rail network. That could change the attractiveness of SmartTrack service, and Scarborough riders could conceivably face a higher fare to ride their new routes downtown. Metrolinx has not given any hint of what it would charge to provide the SmartTrack service either as its own direct operation (the most likely scenario) or on a lease basis with SmartTrack having trackage rights on GO corridors. GO costs per passenger are much higher than TTC costs, but these are for different networks, service designs and travel patterns. How much it would cost Toronto to provide SmartTrack service as part of the TTC rapid transit system and fare structure remains to be seen. SmartTrack was claimed to be a self-sustaining project with revenue from Tax Increment Financing (TIF) paying the bills. There is no published study beyond election literature supporting this concept, and it depends on finding new development that would not occur absent the SmartTrack line. In Toronto’s strong real estate market that will be challenging. By contrast, although the stated purpose of the Scarborough Subway is to stimulate growth at the Town Centre, there is no mention of TIF charges to recoup the city’s investment in new rapid transit. A rapid transit service on Sheppard of a yet-to-be-determined nature. This could be the Transit City LRT line east from Don Mills Station to Morningside and south to UTSC, or it could be an extended Sheppard subway ending at the Town Centre. Additional stations on the Scarborough Subway at Brimley/Eglinton, Lawrence/McCowan and an extension north to Sheppard. This would effectively re-invent the subway as it is currently proposed. At a minimum, provision in the one-stop subway structure and alignment will be needed to make future stations possible. The Crosstown East could gain extensions to Malvern, Port Union or Highland Creek Village, although some of these sound more like wishful thinking than planning, and they are notably absent from any maps. While briefing the media, Chief Planner Jennifer Keesmaat used the phrase “not in my lifetime” when asked about any new east-west service into STC. That is not the most hopeful of replies, and it begs the question of why future lines are even on the map. When Mayor Tory announced that the western leg of SmartTrack would be swapped out for the Crosstown West LRT, the decision was based on a detailed engineering report showing the complexity and cost of an Eglinton SmartTrack spur to the airport. Moreover, the LRT alternative performed better in demand models in part thanks to better transit coverage and ease of access. The words “evidence-based decision making” rang in the air. No such detail is available to support the Scarborough proposal. Although demand models have been run for SmartTrack, including a review of how it would behave on the east side of downtown, planning staff could not cite any numbers for a plan with both SmartTrack and the SSE. There is no engineering analysis of the feasibility or effects of shoehorning infrastructure for SmartTrack trains running every five minutes into the existing rail corridors, nor of the impact at Union Station of adding over 25,000 new riders on top of GO’s forecast doubling of commuter demand, nor of the operating cost and subsidy requirements of this major new service. Also absent is any reference to “Tax Increment Financing” which was heralded during the election as the basis of SmartTrack’s construction. 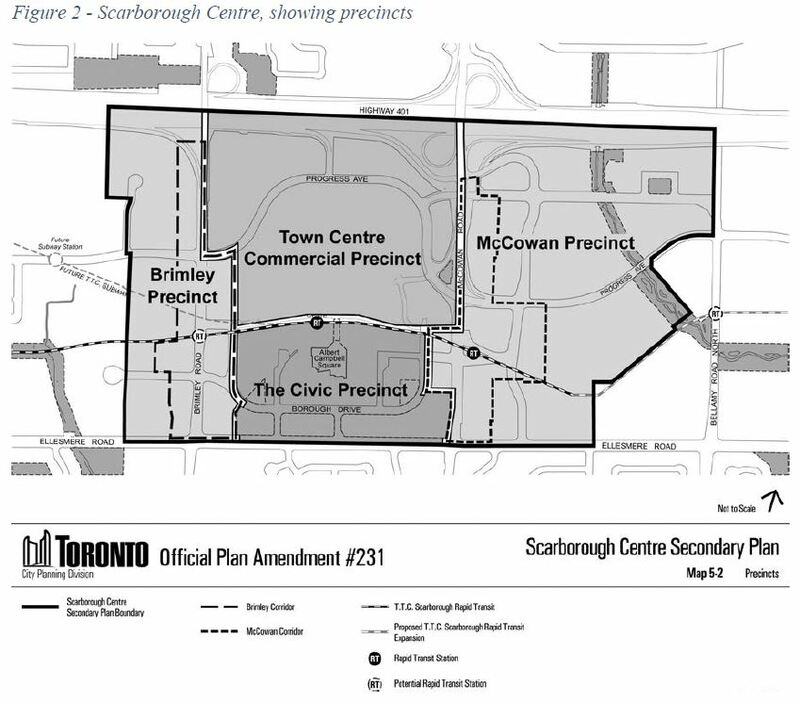 Replacing evidence, the media briefing included a lot of tub-thumping about the future of Scarborough as an employment centre, not just as a bedroom community. This may be music to politicians’ ears, but it is sadly reminiscent of plans four decades ago to create urban centres in Etobicoke, North York and Scarborough. The Sheppard Subway plans were based on development and jobs at STC that never materialized, just as they did not appear at the Six Points in Etobicoke, and only to a limited degree in North York. Condos have been the dominant built form there, not office buildings that skipped over Toronto suburbia and fled to the 905. Now the development market is downtown again. Even the question of demand is spun to suit the political times. The official line now amounts, in effect, to “demand doesn’t matter,” and in support of this claim, there is a map showing existing demand at subway termini. Source: Media briefing, p. 10 [PDF]. The numbers here are all well below the threshold at which subways are supposed to be justified by demand, a cost-effective way to move people. However, demand does not materialize only at the terminal stations, but along the route building as it does on both Yonge and Bloor to packed trains downtown. Conversely, if STC is to be such a hotbed of development, then this would create counter-peak demand on the subway line. A useful planning exercise would be to determine just how much development is needed to generate substantial subway traffic. This is a chicken-and-egg problem, and Toronto should understand what future land use must be achieved to validate the rapid transit plans. What we don’t have, because the demand simulations have not been run yet (or maybe they have, but the numbers are not public), is the demand between STC and Kennedy Station, and how this relates to SmartTrack. The debate about whether we should have one line or two, the route and stations for each line, is neatly skipped over. What we do know from material at an earlier briefing is that SmartTrack will have a very high demand leaving Kennedy Station inbound if it can actually be built and operated as planned. 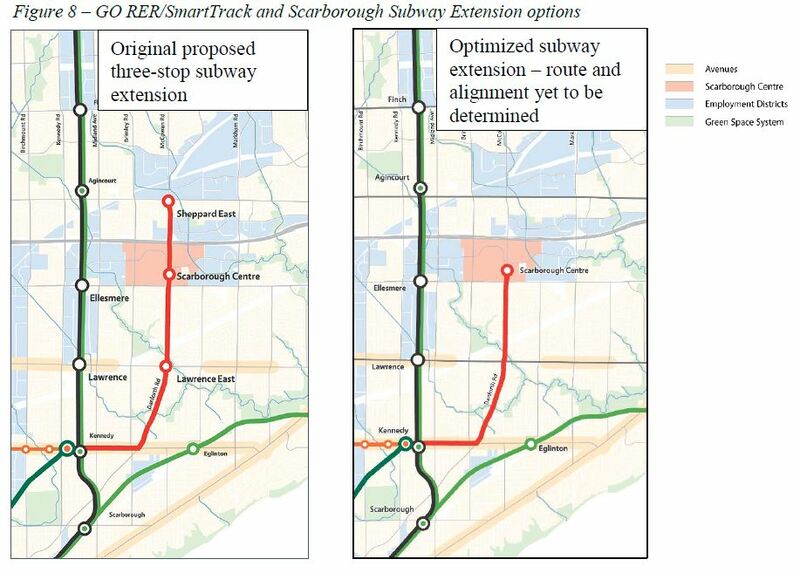 It is unclear how there could be demand projections for SmartTrack at Kennedy, but not for the Scarborough Subway. The issue with the should-we-build-a-subway debate is not that terminals will have lower demand, but what the cumulative demand along the route would be, and whether shifting the subway terminal north to STC would actually improve operations by getting more people on the subway sooner. That is a valid point. Imagine that Finch Station has not been built, and all of the buses now feeding it had to pour south into Eglinton. The need for an extension would be obvious, but that’s not the argument City Planning is making. The nub of any study comes in evaluation of alternatives, and this is the most likely place where an unseen hand will tip the scales to favour one scheme over another. There are two priorities for Scarborough: serving and developing the Town Centre, and providing better local service. The evaluation of each possible scheme is consolidated in two charts. Source: Media briefing, p. 15 [PDF]. The table contains two rail options that rank poorly on “Encouraging Development and Jobs”: a Scarborough LRT and a Scarborough RT replacement. Both of these routes have more stops and directly serve more of the Town Centre area, but they are not given credit for this. Oddly enough, none of the other options rates a “good” here either. The primary role of new transit to STC appears to be as a link from it to the rest of Toronto. That’s not a job-oriented link, but one that will make thousands of commuters who funnel into STC station happy. Source: Briefing note, p. 19 [a href=”www1.toronto.ca/City%20Of%20Toronto/City%20Planning/Transportation%20Planning/Files/pdf/21-01-15%20Breifing%20-%20Scarborough%20Transit%20Planning%20Update.pdf”>PDF]. The second priority is the improvement of local transit for which the Scarborough Subway gets deservedly low marks. 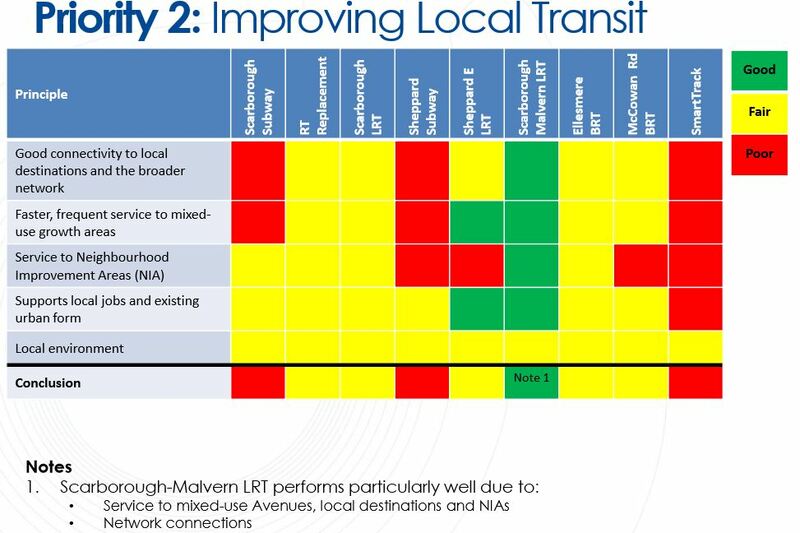 The two RT replacements score better, and the Crosstown East LRT (still erroneously called “Scarborough Malvern” in this presentation) does best. This isn’t even a valid comparison because they serve completely different parts of Scarborough and are not in any sense “alternatives” to each other. LRT rates well in a corridor where there is support from planners and politicians, but poorly in another where its function would be comparable. 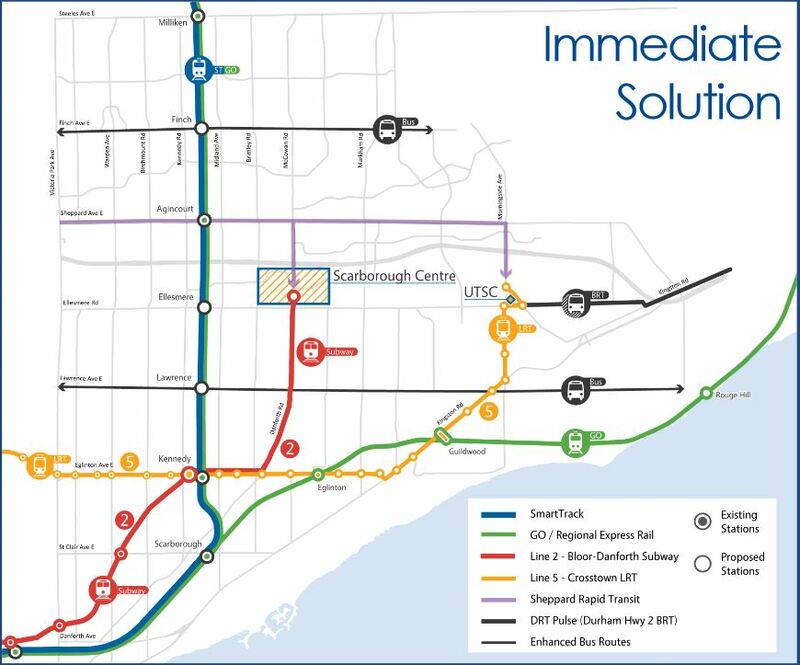 The Scarborough LRT is downplayed so that it won’t look too good beside the subway option, the political imperative whether it addresses Scarborough’s overall needs or not. A detailed comparison (Briefing pp 24-26) includes only two schemes: the original three-stop subway and the revised subway-SmartTrack-Crosstown network. No information is presented to show how a Scarborough LRT running across the STC planning area might perform. The report going to Executive Committee and Council does not bring much in the way of actual approvals for new projects, but reorients studies now underway to consider the proposed network. 1. Executive Committee receive this report for information, and direct the Chief Planner and Executive Director, City Planning Division, in collaboration with the TTC, to continue technical work on remaining issues for the recommended Scarborough transit network, including public consultation on the proposed network in the context of current transit planning, and report back no later than June, 2016, with findings. Political reaction to the Scarborough proposals has been generally favourable. Some LRT network advocates are buying into the idea, while some subway backers welcome the chance to get their project and even more. There will be opposition, but this recommendation will carry easily at Executive Committee and Council, if only because it does not really commit the city to do anything beyond study. For a time, the war between subway and LRT factions will be set aside. The big problems are yet to come, including a detailed engineering feasibility review of SmartTrack and financial discussions about how Toronto will pay the capital and operating costs for this line. On the capital side, the planning so far has been a shell game with existing “commitments” by other governments shuffling from project to project while keeping total costs under control, but the City’s share is uncertain. If SmartTrack proves impractical or unaffordable, its key role on the transit map goes up in smoke and the debate must turn to alternatives. Mayor Tory is betting his credibility that this will not be the outcome. The shift in planning and political discourse to the concept of a transit network is important, and this must not be lost in future debates. The worst outcome would be a return to a council squabbling over which few kilometres of subway they could build with limited funding while steadfastly holding the line on taxes and strangling growth and improvement of transit overall. Too many decades in Toronto have been wasted talking about, but not building, transit. A single subway extension every decade or so does little to improve transit’s credibility or dent the growing demand for car-based travel as the only realistic alternative for most commuters. Announced plans litter Toronto’s history, but few opening day ribbons have been cut and transit riders despair of seeing even a bus, let alone a shiny new train. There is a brief chance while the interests of all governments converge on infrastructure spending, job creation and the role of cities for Toronto to launch a plan that will actually get built.